April began with a trip to a friend's house for some shenanigans with cannons and my introduction to the 'black art' of black powder, bwahaha. Once I was home again I was building more stuff to do weird things in the workshop. 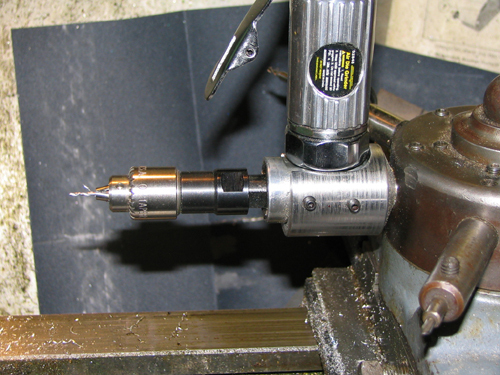 Even on a high speed lathe it's sometimes necessary to drill teeny weeny holes that would go smoother at much higher speeds. I had a production part that reqired 1/4" deep #68 holes. 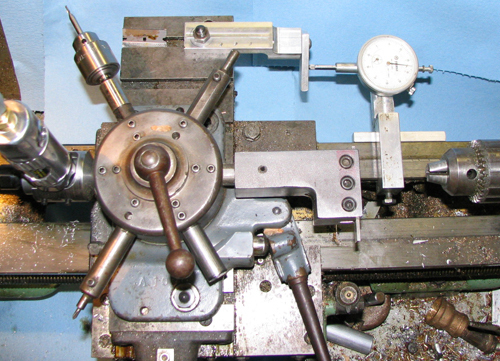 To finish the part there were subsequent operations, so a turret was the best way to mount all of the tools, to get the part cycle time as low as possible. Photo #1: The trouble with a small turret, like the one on my Myford Super 7B lathe, is that there's very little room for 'live' tooling. I made this crude but effective adapter to hold an $11.- Harbor Freight air grinder, to which I'd attached a Jacobs #0 chuck which could hold the #68 drillbit. Total cost: less than $50.- Plan B with a precision spindle would have been closer to a grand..
Photo #2: Business end of my lathe with most of the tooling attached to the turret. The dial indicator holder/reader widget could use some tweaking: it works but it's far from ideal. Anyone got a better idea?